I think my recent move did a number on my daily journaling habit. I was in such a time crunch and so tired that there were many days where I failed to write anything down in my Field Notes, or in Hobonichi no less. I'm slowly relearning my daily routine and using my favorite pens and pencils more regularly now. 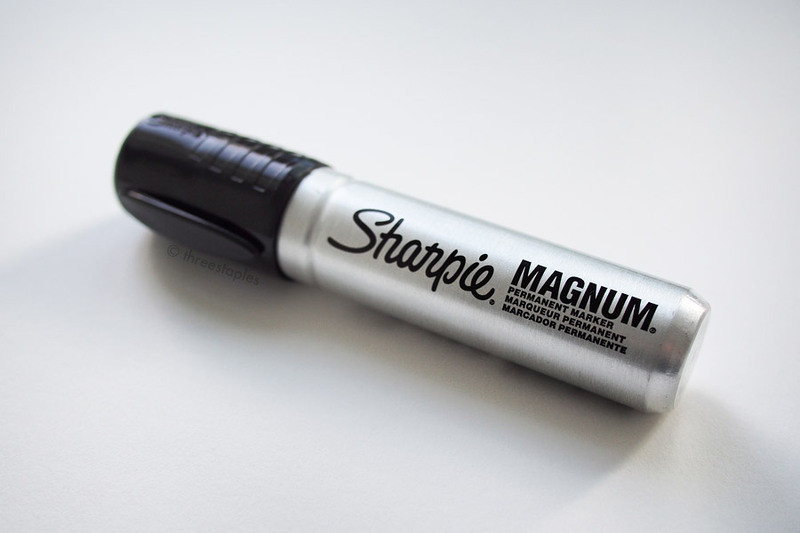 But during the move, I think the “pen” I used most often was this Sharpie Magnum. Not my trusty Pentel EnerGel Euro Needle or Uni-ball Signo (even though these were included in my go-to pencil case, with everything else packed away). Just this hefty, smelly, oil-based, black marker. As you can see it's much thicker than the “regular” Sharpie marker, with a very wide tip. For the longest time, I had no idea it existed, even though I've been a long-time user of various Sharpie markers. I wish I'd had it during my previous moves because it was so convenient for labeling my moving boxes. See, I like to number my boxes and then keep a very detailed list of each box's contents, grouped by numbers (the list was kept on my iPhone this time). It makes searching for specific items so much easier later. While the regular Sharpie (in “Fine Point”) would have been adequate for labeling on the boxes, with the Magnum marker I was able to write bolder numbers much faster that are easier to read. A case in point that the tip size matters. These days, I just use it for the initial purpose for which I bought it: to cross off any unwanted marks or addresses on packages before I discard them or reuse them. Do you use any big markers like this often? What do you use them for? What was your favorite tool during your last move?